Coral Cay is a delightful Ocho Rios property that has been beautifully renovated in 2017. The property consists of three separate, identical 4-bedroom villas set in a beautifully landscaped lawns and gardens leading to a private, sandy man-made beach and semi-enclosed marina pool. The villas can be rented separately or together: Villa #2 also has a 1 bedroom Suite that can be rented to provide a total of 5 bedrooms. The Suite can be entered either from outside or by connecting hallway from the main house: the outside entrance can be shut off at guests' request. The villas are similarly furnished in coastal contemporary style, and all bedrooms are air conditioned and have private bathrooms. Each villa has balconies and verandas with views of the gardens and the Caribbean Sea. Each villa has three King bedrooms and a fourth bedroom that has two double Queen beds. 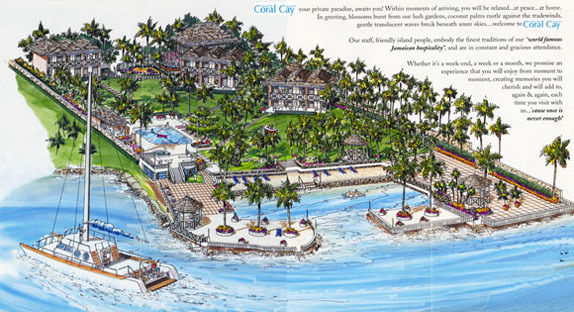 There are a total of 13 bedrooms at Coral Cay. Outdoor spaces are emphasized here, with several options for dining by the pool, sea-side, or on the expansive lawns. The spacious pool deck and bar area are ideal for relaxing in the warm Jamaican sun, while the sea water pool of the marina offer protected swimming in the sea. The marina pool offers easy access to the open Caribbean and the reefs that line the coast. Enjoy spectacular sunsets from one of the waterfront gazebos. Coral Cay is ideal for family reunions, weddings or large groups, but the villas can be individually rented if you have a smaller group. Each villa has its own staff. If one group rents the entire property, all may dine together in the dining pavilion by the pool. If there are multiple, separate groups, you still have the choice of dining outdoors or in your villa. Shared areas when villas are rented separately are the lawn, outdoor dining, pool and beach. Coral Cay villas are fully staffed with, cooks, housekeepers, laundress and gardeners. Private Gym including elliptical, recumbent stationary bicycle​, Kinetic multi-gym,​ & 5​ to ​50​ ​lb dumbbell rack.